MOT tests can be a nervous time for any vehicle owner. Will it pass it’s MOT? What will the costs be to get it roadworthy? Your vehicle can fail its MOT for many reasons, some are more serious than others. The majority of MOT fails, however, can be avoided by carrying out simple checks and maintenance before taking your vehicle in for its appointment. An MOT Test will check integral components of your vehicle to ensure it’s in a roadworthy condition. If your vehicle meets the standards set by the DVSA you will be issued a new valid MOT certificate for the next 12 months. However, depending on your expiry date this could be 13 months. 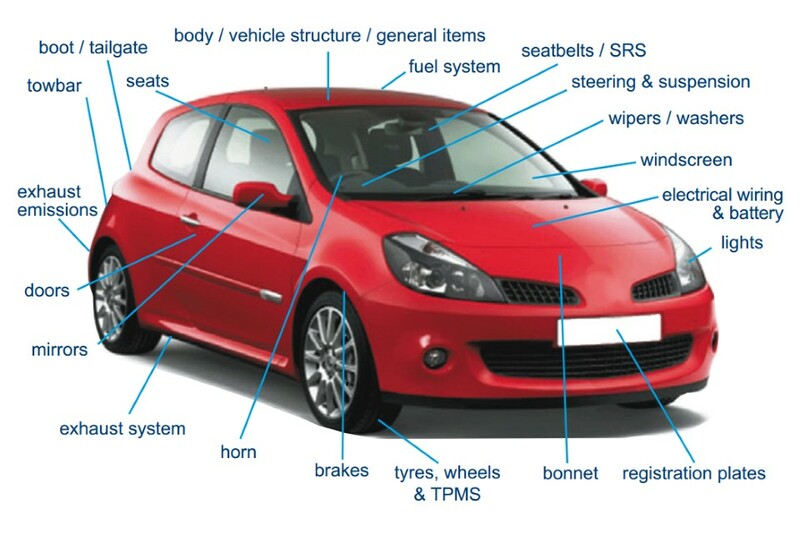 The below image shows a quick overview of all the vehicle components checked during an MOT test. It’s important to note that an MOT test is not the same as getting your vehicle serviced. Below is a complete list of all the things our DVSA approved MOT testers will examine on your vehicle and the key aspects they will be looking at. The overall condition of your vehicle will be examined during an MOT test to ensure that it is roadworthy. For the electrical socket it will be tested to ensure that it activates the trailer parking lights, brake lights, indicators and rear fog lights. When looking at the condition of you towbar the tester will be checking that it is secure and not damaged or corroded. If your fuel cap requires the key to open it make sure the tester has access to the key. The legal limits for emissions vary depending on the age and fuel type of the vehicle with much stricter limits on newer vehicles. The tester will use specialist equipment (gas probe analyser) which is connected to your car’s exhaust whilst the engine is running. It will measure if your car is within the legal limits for carbon monoxide and hydrocarbon exhaust emissions. If they do not fall within the legal limit you will be looking at a fail. A visual inspection will also be carried out to check for excessive dense blue or black smoke produced by the exhaust. Noise levels will also be tested. The vehicle will be inspected to check for the minimum number of mirrors, their condition and security. Indirect vision devices will also inspected to ensure they are in full working order, for example, rear view cameras. Brakes are also a worryingly common area for cars to fail there MOTs. The overall condition of your brakes, pedals and levers will be inspected, as well as any relevant warning lights. Make sure to listen out for any squealing or grinding when you brake, these are tell tale signs your brakes could do with some attention. Be sure to also check that your vehicle doesn’t pull to one side when braking. Your registration plates must be secure and clearly legible. It’s vital to ensure that the characters on the number plate can be easily read, and are correctly spaced and formatted. Lighting and signalling issues are and have always been the most common reason for MOT fails. However, they are one of the easiest areas to check before taking your vehicle in. It’s also important to note that pairs of lights (i.e rear brake) must emit light of the same colour, size and shape. Your vehicle can be failed if one indicator light is a darker orange than the other. Headlight aim (both dip beam and main beam) should be below the horizontal, so as to not distract and temporarily blind passing drivers. This will be inspected to check that it closes securely. Ensuring the driver has a clear and unobstructed view of the road is vital. This can even include hanging air fresheners on your rear view mirror, which can be a fail. Leaving your sat nav in place, if it affects the drivers view can also be worthy of a fail. There must not be any damage or obstruction to the view larger than 10mm in the area directly in front of the driver. Outside this area (but within the reach of windscreen wipers), there must not be any damage or other obstruction larger than 40mm. You’ll also want to check that your windscreen wipers are working as they should, as if they can effectively clear the driver’s eye line your vehicle will fail its MOT. One thing that is often over looked here is ensuring your washer fluid levels are at the correct level. Steering and suspension are areas of common failures, in fact it’s close to 1 In 10 fails is due to steering or suspensions. Failures in this area can be tricky to spot before your test but it’s not impossible. One thing to try is to visually look at the parts in the dry to see if there are any wet spots on any of components that make up the vehicles suspension system. However this does not apply for multistage build vehicles (eg van conversion, multistage self-build). Your VIN number is often found at the bottom of your windscreen, or under the bonnet. Visible electrical wiring will be inspected to check that it is secure and not be damaged to the point where it is likely to short circuit or become detached. Your cars battery will also be checked, again to make sure that it is secure and does not show any signs of leaks. For diesel vehicle owners MOT testers can be slightly trickier. For example, The MOT tester can refuse to test your vehicle if they think that the smoke test may damage your engine. If you think this might happen, you should tell them before they start the test. The visual checks we recommended above could prove vital here. It would also be beneficial to go to the test with your vehicles engine fully warmed up and make sure to check our oil level before the test. Keeping your vehicle maintained and services will also increase the chances of it passing its MOT test, for example regular oil and filter changes. As you can see a lot of checks are simple ones you can quickly do before taking your vehicle in to be tested. 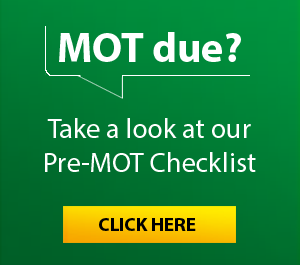 Our pre-mot check video will walk you through these step-by-step so you can increase the chances of your car passing its MOT. 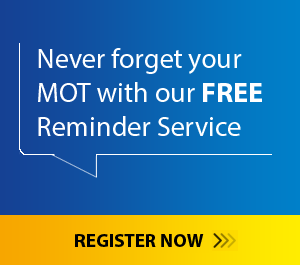 We offer a free MOT reminder service so you will never forget your MOT due date again.